These diaries are your past, and your past is crushing you. Betty: What, Mom? What does some guru who’s running a heaven’s gate commune for pregnant runaways and wives of serial killers have to say about my diaries? Alice: We know that you look down on the Farm, Betty. But, Edgar has done nothing but help me. He’s encouraged me to embrace everything that I was ashamed of and become the best version of myself. Riverdale Season 3 Episode 1: "Chapter Thirty-Six: Labor Day"
Cheryl: Greeting chums! I wanted to let you know that after the three *amazing* months I just had with Toni riding our motorcycles cross-country, we’re celebrating with an epic end-of-summer pool party at Thornhill. And you’re all invited! Of course, given the fact that Archie will most likely walking the green mile while the rest of us are walking the stage at graduation, I understand if you’re not up for it. Invite whoever you want, but give them fair warning: I’m in the mood for some hell-raising. Tootles! Permalink: I’m in the mood for some hell-raising. Veronica: Are you happy now, Daddy? It all worked out, just like you planned. Archie didn’t play by your rules. He threatened you, so you punished him. You destroyed his life. Hiram: You think I did all this to hurt Archie, Miha? Because he threatened me? No, it’s because you betrayed me. Hiram: This is your punishment. You chose that boy over blood. My own daughter. Veronica: You don’t have a daughter anymore. Permalink: You don’t have a daughter anymore. 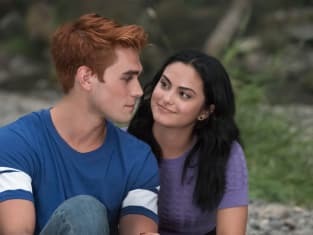 Riverdale Season 3 Midseason Report: Best Couple, Most Improved Villain & More!